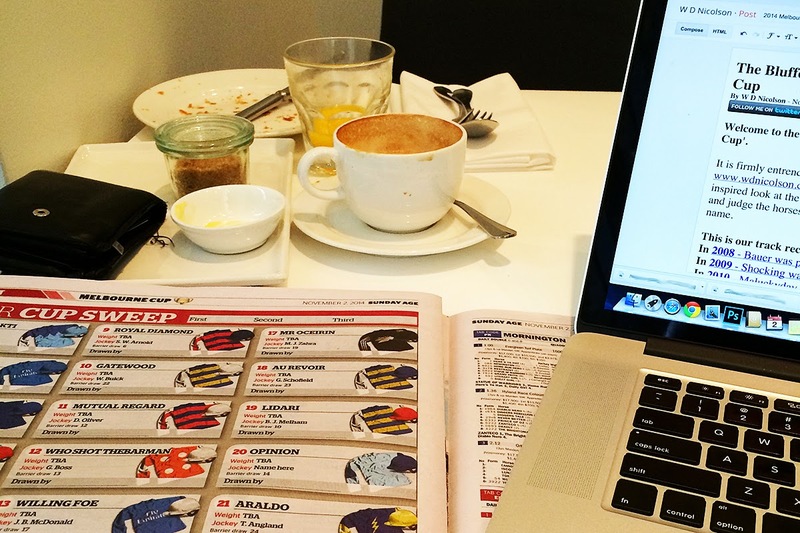 Welcome to the 7th Annual 'Bluffer's Guide to the Melbourne Cup'. 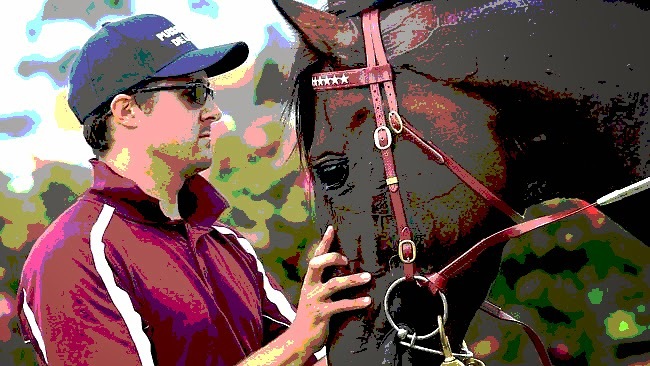 This is a special edition of the Bluffer's Guide - written on location in Melbourne the weekend before the big race - and although this is the only Horse Racing piece you see on www.wdnicolson.com each year - we guarantee it is the best one! The brief is simple - we take a less than inspired look at the huge field for the 3,200m race at Flemington and judge the horses in the race based purely on the quality of their name. In 2010 - Maluckyday was picked to run 2nd and did... So You Think was picked to run 1st and was 3rd, Americain was picked to run 5th and won and Harris Tweed was picked to run 3rd and finished 5th. In 2011 - American was picked to repeat and finished 4th... Dunaden was picked to run 4th and won, and Lucas Cranach was picked to run 5th and was 3rd. In 2012 - Mount Athos was picked to win and came in 5th, Glencadam Gold was tipped as a roughie and came in 6th, while the rest of my selections stunk deluxe... And of course, Green Moon continued to get the 'Pride of Endor' wordplay treatment but no love from my selections... and then won the thing. And last year in 2013... we kept up the very average predictions. Fiorente won after we picked it to finish 5th... Royal Empire was our pick and it plodded home in 14th... Sea Moon and Mount Athos finished 13th and 3rd (so we got Mount Athos 100% right)... while Dandino finished 5th after we had it 4th and our 6th placed finish - the aptly translated Voleuse De Coeurs (Run from the Toilet) was 10th. But you aren't here for any punting tips, you're here to see if for the 7th straight year I can come up with some moderately interesting lines pertaining to the competing horses in the 2014 Melbourne Cup field right? As we stress here on www.wdnicolson.com, think long and hard about what you could spend (or save) the excessive money you punt with on Melbourne Cup day... in short, don't be an idiot. Anyhoo, to the Bluffer's Guide - each horse has its current Sportingbet prices (as of 2/11/14) listed next to the horse's name and below that is our 'Scouting Report'. Sorry even if you are the current favourite, I do not admire your name enough to pick you to win this thing. What chance does this horse have if all I can think of is this when I see its name? 6th last year and I think there's a park called 'Fawkner' like 1km from where I'm staying in Melbourne... but sorry, not gonna happen even with the proximity factor at play. I'm out of clever things to write about this horse... this is year #4 if I'm not mistaken but it regularly contends so put it on your possibles list. There was once a Transformer called Protectocon... okay maybe there wasn't but given how bad the last Transformers movie was - that borderline joke is already a better use of the Transformers IP than that movie was. See that moon way out there in the night sky? Well that's about as close as this horse is going to get to winning in this year's race. I've got nothing... not a good sign 7 horses in for the Bluffer's Guide in 2014! So what drugs were this horse's owner on when picking this name? Or were they going for a half decent Scrabble triple word score? Just too pretentious a name for my liking... no chance. Depends which gate this horse would run from... yikes, we're in all sorts ladies and gents! I can only assume horse names are not allowed to have a ? on the end of them... otherwise this horse would be my pick based on moderate name creativity alone. Meh... I'm not going to try as hard on this name as their owners did to sound impressive. Looks up ambivalent... not sure which meaning to believe. The name suggests this horse ran before and won... but at $91 don't believe it. These things just don't go away easily... my roughie for the Cup. Initially read this as Mr O'Certain... then looked at the price... not as convinced. Take it as read - this horse can't win. Had an awful US Talk Show in the 1980s and 1990s... so has to be a bit long in the tooth now right? Shouldn't this be on a runway in Paris somewhere? Baby I'll set you free right now - you won't win. This is a sign... last horse with one of the best names... your Cup winner ladies and gents. Ok let's be honest - this year's horses gave me very little to work with name wise... but now to the tips, hopefully they improve on an awful sketch routine above. Roughies - Brambles at $41 and Araldo at $31. Let's be honest - we've got no idea about any real chances here and we're actually more interested in better names to work with next year than who wins in 2014!